When Gulfstream Park resumes racing on Wednesday, it will have a Rainbow 6 carryover of $1,265,192. 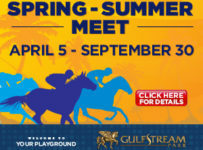 The carryover has grown because Gulfstream has gone 20 straight race days without the jackpot payoff requirement of just one ticket with the winners of all six Rainbow 6 races. Sundays winners on this wager pocketed $3,748 to approx. 60 winning tickets. First post is 12:35 p.m. for a ten-race card. The Rainbow 6 is on races five to ten with the sequence scheduled to start at 2:37 p.m. There are 61 entries listed in those 6 races. 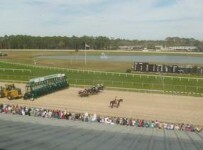 On he first race there is a Super-Hi 5 carryover of $2,302, barring 3 or more scratches of the 9 horse field as planned.